Tarte au Citron is a classic French tart made very simply with lemons, lemon zests, eggs, sugar and butter. This mixture in French is called a ‘cremeux’ or citron cremeux because we use a crème anglaise method. It’s simplicity however shouldn’t be underestimated, a good Tarte au Citron is an explosion of amazing zesty flavour and creaminess in your mouth! In English this is called a Lemon Tart, however the English version is not exactly the same recipe. In general, the French version is creamier due to the use of butter. 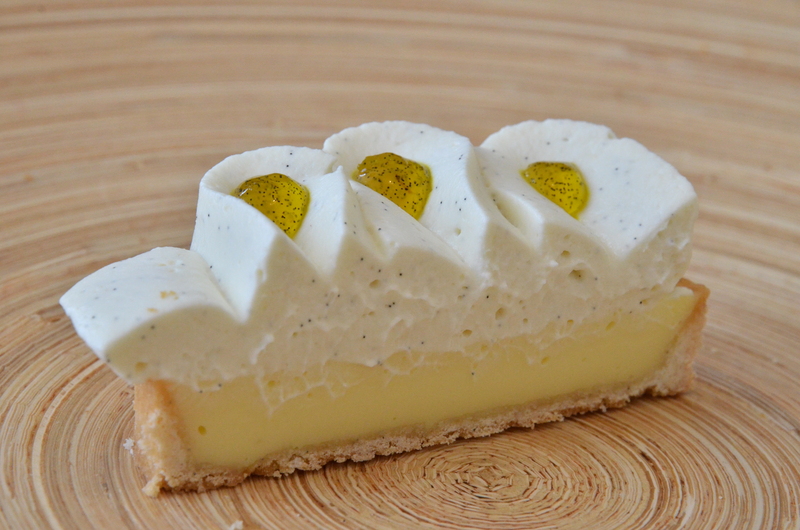 English lemon tarts tend to be more jelly in texture, traditionally made with cream, cream contains around 25% – 35% fat content, and butter contains a minimum 60% fat (I speak for French butter) making the French version creamier. Of course quantities differ if you’re using cream vs butter. I applied chantilly (whipped cream) over the top with a piping nozzle (tip) called, Saint Honoré simply because I had some liquid cream in the fridge to use up and thought “why not?”. I then added citron confit* into the crevices. Vanilla grains (grains de vanille) scrapped from vanilla pods are in abundance throughout the tart base, chantilly and confit, it’s okay for me, however this is an expensive thing to do in the workplace. * Confit, is French for a kind of thinkened juice turned syrup. In this case, citron (lemon) confit is made of lemon juice, sugar and water. In other confits you can find added pectin and glucose, for example, fraise (strawberry) confit.